We spent the first night in a small hotel on a busy street near the airport. The next morning after breakfast, we took a tuktuk to the bus station, and then took a bus to Colombo. The bus guy charged us for an extra person because of our luggage, which wasn’t even in a place where a person sits. Oh well… About an hour and we arrived at the train station, to find a train to Bentota. I’m glad my husband was there to take care of that part, cause I didn’t have any idea what line to get in and when I got my ticket, I headed for the nearest train, which was incorrect. I had to run back to catch up to the right train and nearly tripped over my floor length skirt. The photo from my last post with the fans on the ceiling were taken in the first train ride. 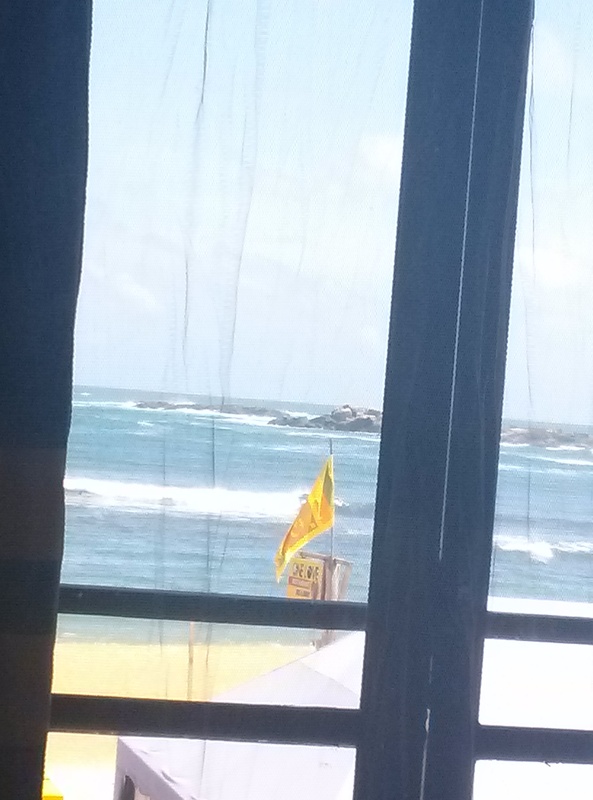 It was really hot, but I was too fascinated with the views of the little shacks, and the ocean next to the tracks to care too much about the heat. My husband stood in the doorway of the train car the whole time. I preferred the safety of the train walls around me as we moved along at a pretty good rate of speed sometimes. 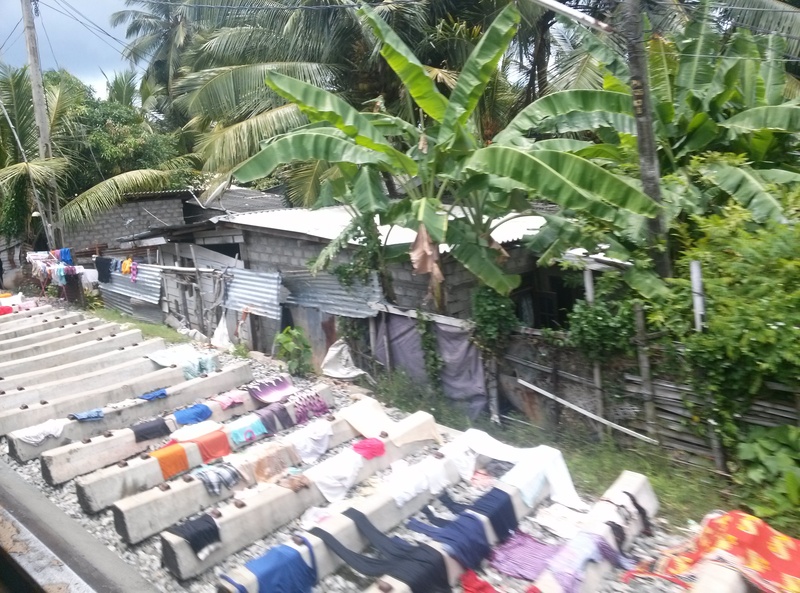 There were sections of the tracks that were being built along the way, but were being used by the locals as a place to dry their laundry. I thought it was a pretty cool idea, as it was in the sun and it looked clean. 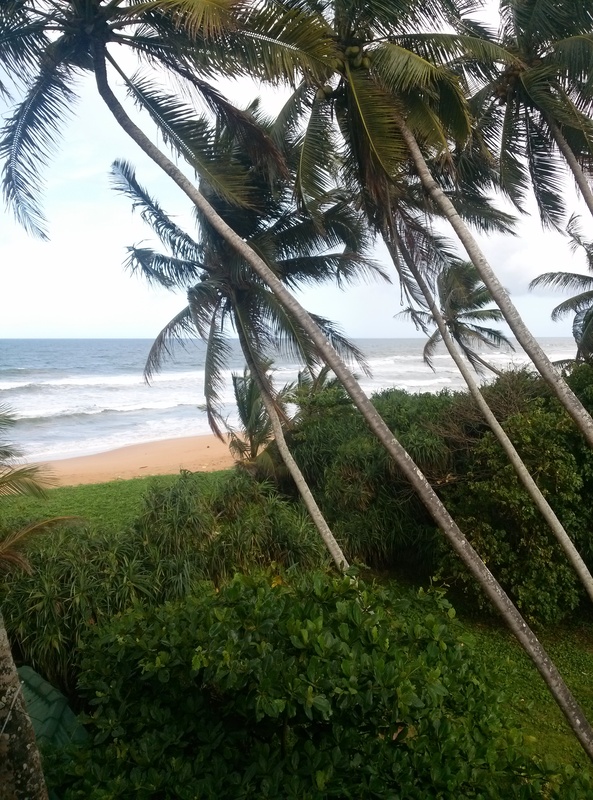 There was a tuktuk driver at the station in Bentota who “had a friend with a place where we could stay” so we went with him down these roadways that didn’t hold any promise to me as a place to stay, so we declined and had him take us somewhere else. We ended up at a place directly on the beach called Warahena. It was beautiful and rustic in looks. A breeze from the ocean could be felt as soon as you stepped out of your room. 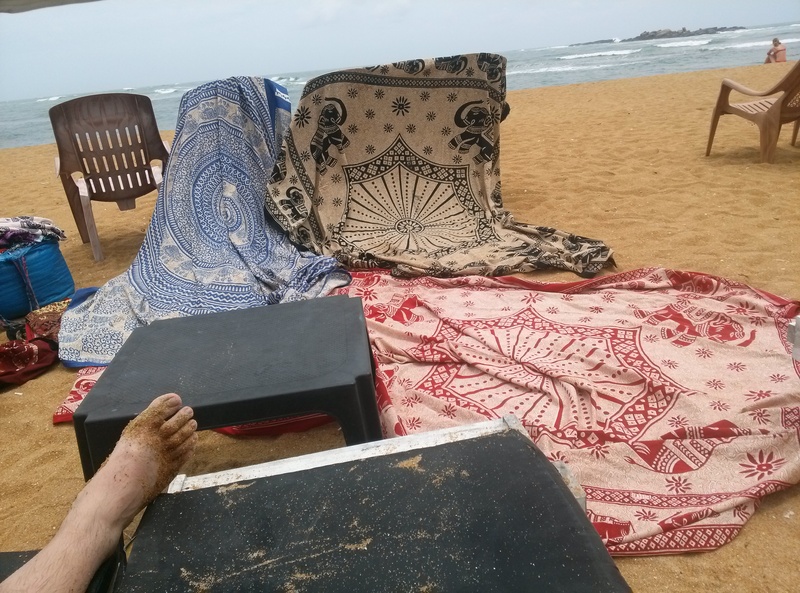 Food was served on the beach, weather permitting. and it wasn’t packed. the beach was very quiet and perfect for walking by yourself. The waves on the other hand looked way too dangerous for me. So I stayed out of the ocean. In fact there was a guy at the hotel who thought I was going to swim one day, and he warned me not to. I think the only down side to this place was the food. It just wasn’t great. My husband wanted good grilled (on an open flame) meat, and they just didn’t do that there. We ordered a side of bacon one morning with out breakfast and were quite shocked at the fact that it wasn’t edible. It might have been a couple months old…who knows. It was gross. After a couple nights here we headed back to the train station for yet another destination further south. 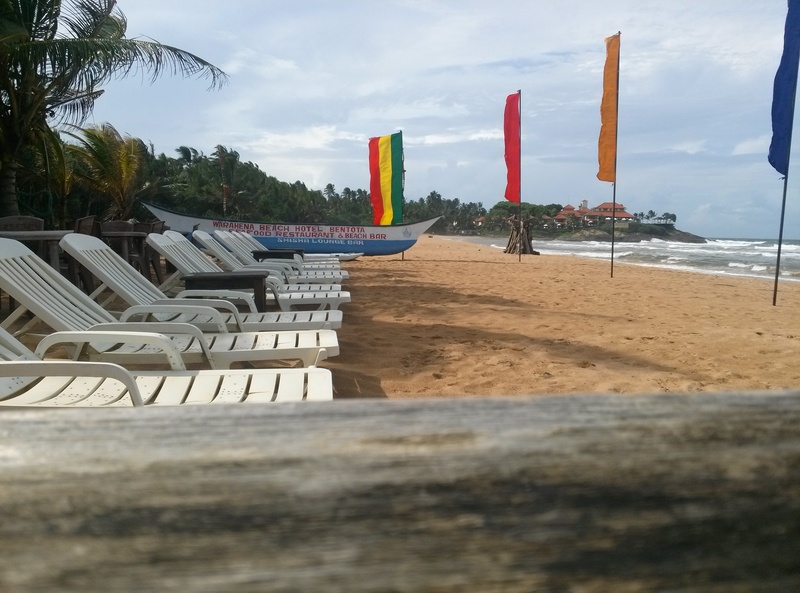 Next up we went to a beach town called Unawatuna. Cool place, with a laid back vibe. Keep in mind we were there during the slow season. We had booked a place online for a couple nights. This was to ease my travel stress more than anything, as I am the one in the relationship that likes a destination more so than my husband, who is more of an explorer. 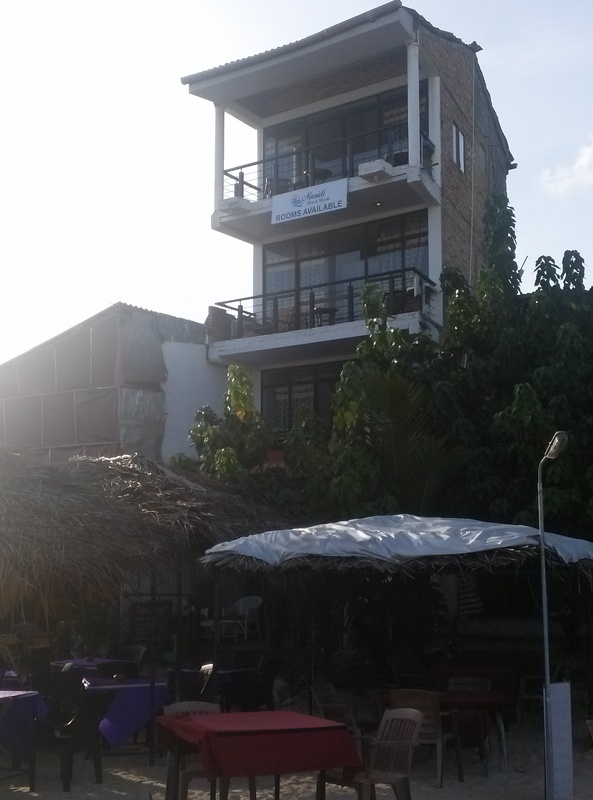 The place had a super relaxing atmosphere, and was under 20 US dollars a night. 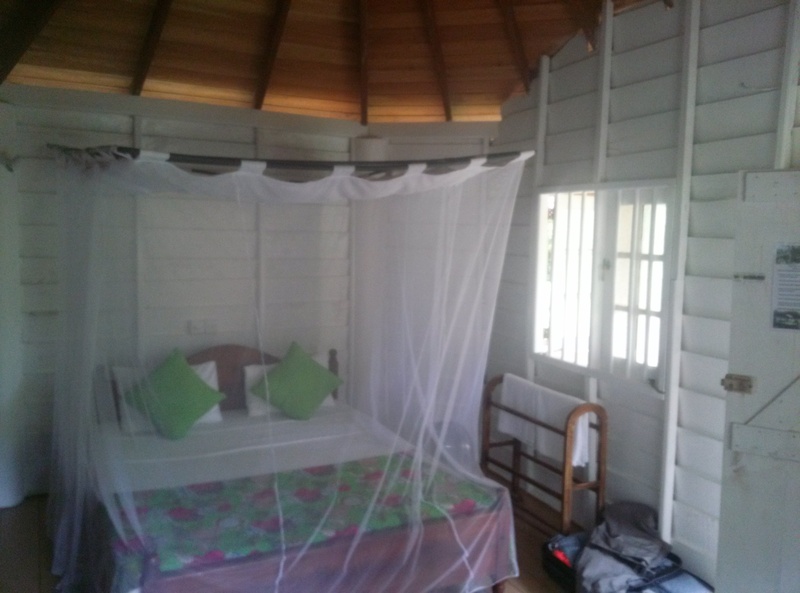 That got us a small bungalow with a tiny bathroom and a queen sized bed under mosquito netting, open windows for fresh air, and an overhead fan. Please note that mosquito netting doesn’t mean you will not get bit during the night. That night as we both laid in the sweltering heat. As I lay on my back with my arms placed on my sides, not touching the rest of my body because it was too hot for that, I thought to myself… “I wonder which one of us will cave first” And in my version of the story it was my husband who stated the next morning that we needed to find a place with air conditioning ASAP. He also may have added that he would probably use my pregnancy, and needing more comfortable air as a reason for backing out of our reservation. I was okay with it. I really was. I will add that in all the places stayed while on the trip, it was probably the most charming of them all. Our bungalow. It was super cute. It was also super hot! 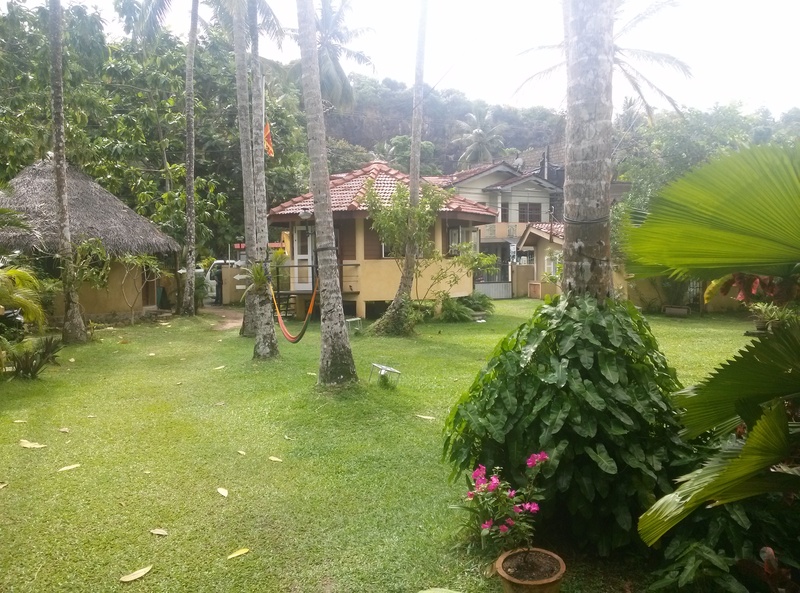 This particular bungalow on the property, had a coffee and pastry shop with delicious croissants. Originally we had a room on the middle floor shown in this photo, but the air conditioning wasn’t functioning correctly, so they moved us down one more floor. The view was still lovely. 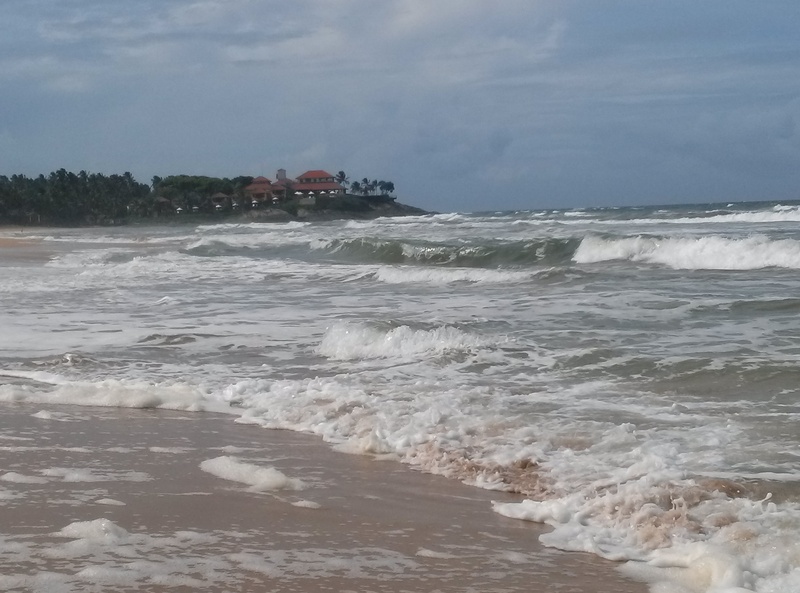 This was part of the beach at Unawatuna. Everywere we went, people told us that in a few months the waters would be like a bathtub. Smooth and clear. 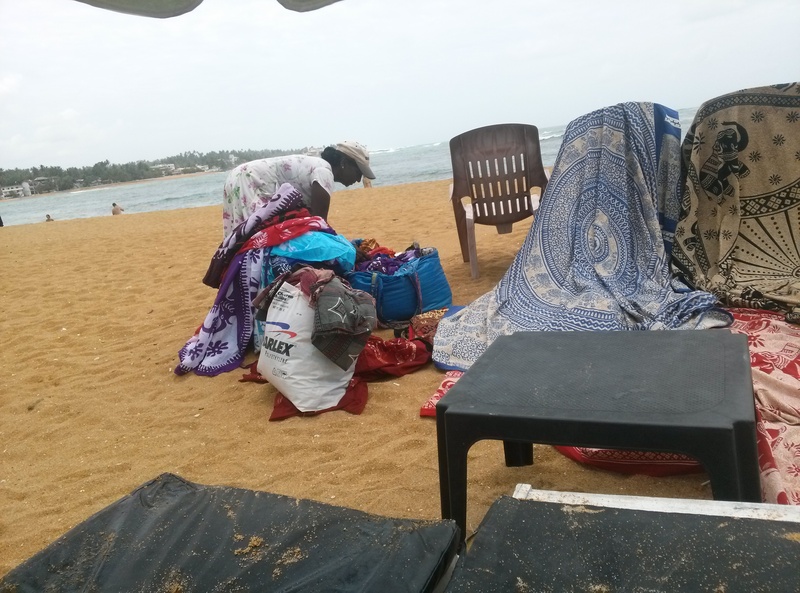 We were also bombarded with locals selling things along the beach. They didn’t always take no as final. They would insist on showing you what they had in hopes you would crack and buy (in this case, gorgeous fabrics). I stayed strong and didn’t give in to this lady. Her bags were so packed and she was on the beach everyday! 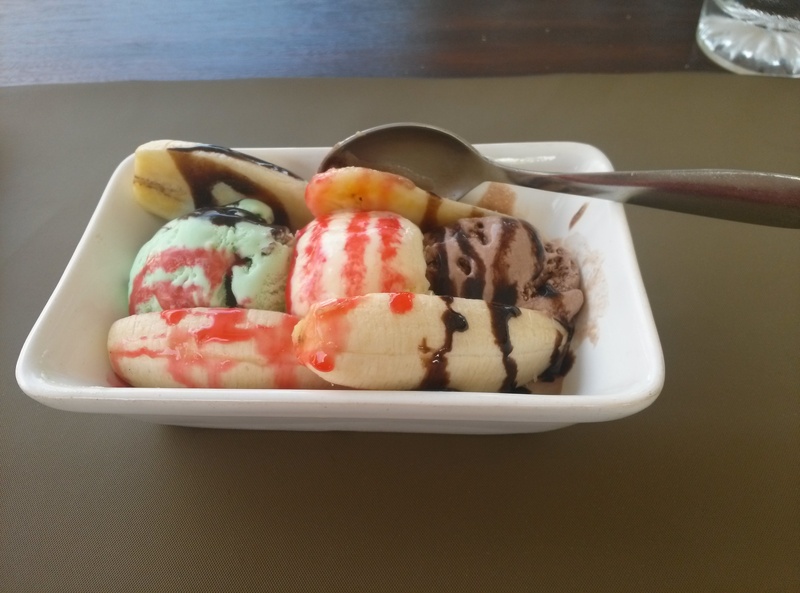 I was craving ice cream one day as my husband took a nap, so I walked down the street a bit and found this hotel that looked promising for a mid afternoon snack. I ordered a banana split. It was literally the tiniest thing ever. The photo doesn’t show it, even though I placed the spoon in the dish as reference, but that didn’t work since the spoon was a baby sized spoon! It was darling, delicious, and I paid too much money for it. I’ll upload more photos off of my phone for another post soon. We got back home to Saudi last week after our vacation to Sri Lanka. Almost three weeks away from home can really make you miss the place. Even if it is the desert! We had only been home for a few months since our last trip. But since I have an expanding waist line, and in a few months, will have an extra human to carry with us, we took advantage of the opportunity to travel now while I was still able to enjoy it. When we left, Saudi we had a connecting flight in Doha, Qatar. There a woman noticed I was pregnant and needed to know how far along I was. I guess they have a rule that you need a Dr’s note from your own Dr and the Dr at the Doha airport if you are 28 weeks along. My husband was hoping for some special treatment I think from the airline. They did let us board with the first group of passengers. I personally would rather have hid it, to avoid any special treatment. On our flight home, our seats were in the emergency row. And once again, the belly gave it away and I was told that I couldn’t sit there because they needed “able bodies” in the event of an emergency. It worked out to our favor this time, as they moved us to the center row of four seats. We had it all to ourselves! Plenty of room for activities! 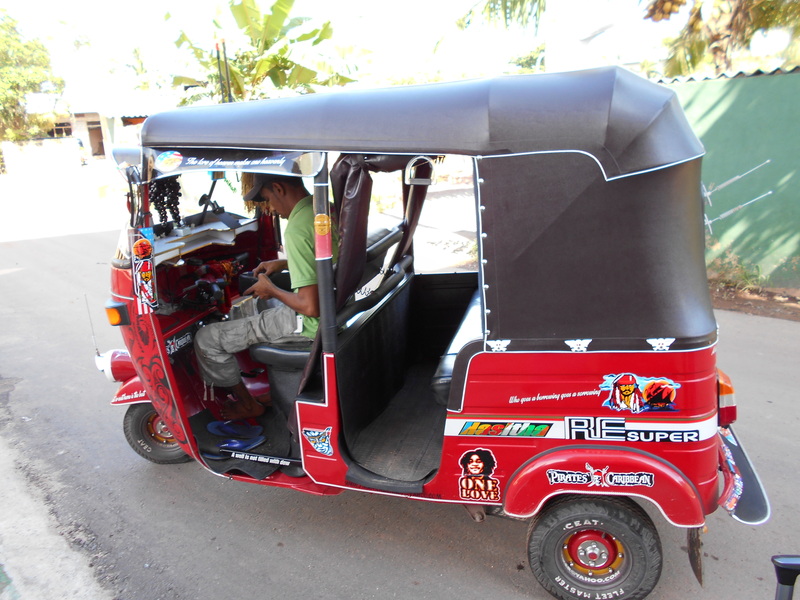 Once on land in Sri Lanka, the mode of transportation became tuktuk, bus, and train for the most part. Tuktuks are cheap to use. It basically is a little scooter with two wheels in the back and a partially enclosed space for two or three to fit snuggly inside. In my experience, most of the tuktuk drivers will wait till the last second to brake and stop within inches of another vehicle. So there may have been many little heart attacks had by me. And there will be those drivers who will try to charge too much. Sometimes, you pay too much because you just don’t have any fight left, and need to get to point B. And then there are those younger drivers who have decked out their tuktuk with blue neon lights and a stereo system in the back! The trains were such an experience. Crammed with people. Sometimes there was only standing room available. Not always a very clean way to travel, especially if you have a small baby pressing on your bladder forcing you to use the toilet on the train. But once again it was a super cheap way to travel. 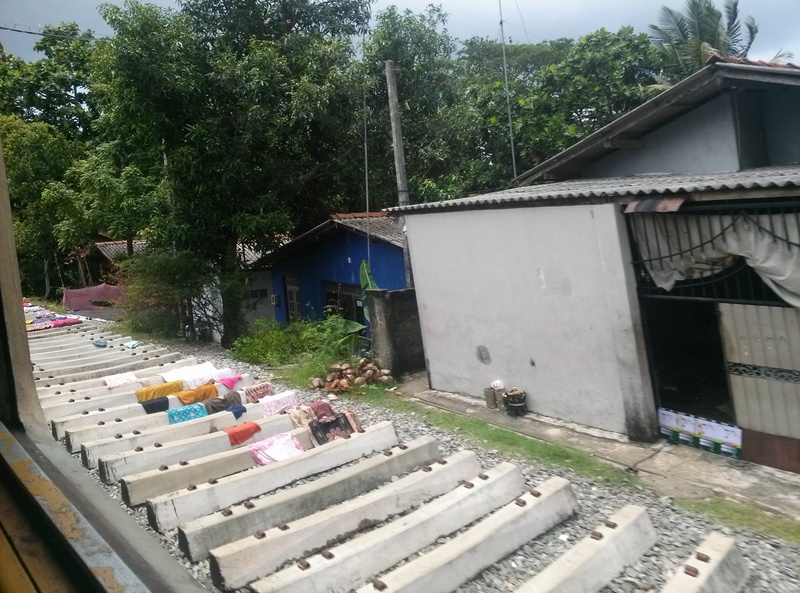 I read that the rail system carries 3 million passengers daily in Sri Lanka. People watching is such a fun thing to do on the trains, along with the ever changing views out the windows. The windows thankfully, can be opened, to allow fresh air. And if you stick your head out the window you will find that you are not alone in sticking body parts or cameras out the windows along any of the rides. That is something that would never happen in the U.S. 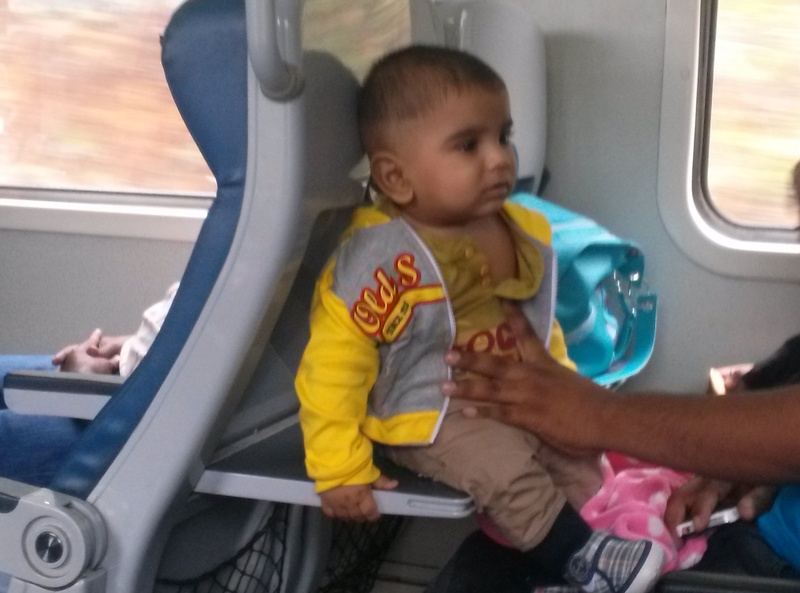 There were signs in a few of the trains that had a “reserved for pregnant mothers” sign at one of the seats. But I never needed to use that particular seat, as those trains weren’t completely full of passengers. I could sit were I wanted. One time, I even sat across from a monk and then realized afterward that it was reserved for monks. No one told me to move. So I stayed. The buses were also a cheap way to travel and even more packed than the trains. Like bodies smashed against each other packed. I was smashed in one time, standing room only and directly in front of this man who sat in the “reserved for pregnant mothers seat” for twenty minutes he saw me standing there and didn’t offer me his seat. I wasn’t really upset about it. And a kind lady eventually motioned me to her seat as she got off the bus. Believe it or not, most times when a person offered me their seat, it was another woman. Just an observation I had. 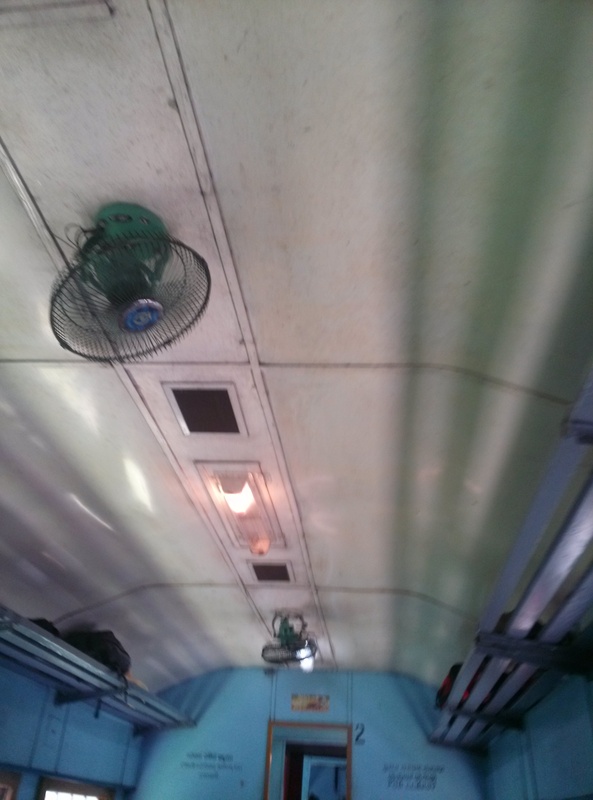 additional air flow in the train. When traveling in other countries like this, I always felt a bit of worry about when I was supposed to get off the train or bus. After all, I know the name of the town, but have to other landmarks or indication of when to get off (“get down” as they would say in Sri Lanka). Somehow it always worked out though. Either a store sign would give me an indication that I was in the right town, or the buss would actually stop at a large bus stop and that was the indication that it was the end of the line. Sometimes, a nearby passenger would kindly tell you when to get down, if they understood your request for help. Both the buses and the trains would have vendors who would get on board at stops to sell little bags of peanuts, mango slices, popcorn, some other food items that I didn’t want to try, even whole ears of cooked corn. I usually had my trusty snack of Ritz crackers to satisfy my hunger while traveling long distance. One lady gave me a cup of yogurt also. 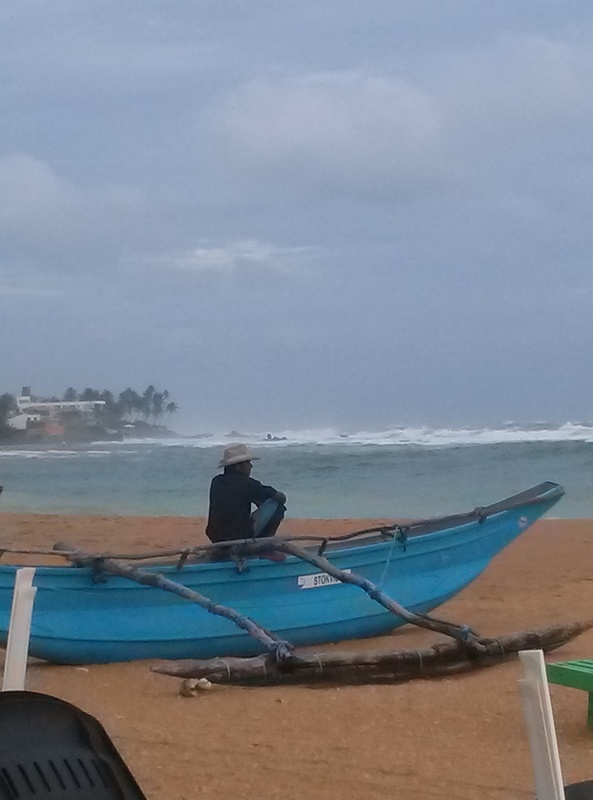 I think I will try to break up the Sri Lanka adventures into a few posts, so its not one incredibly long read. So be on the lookout for the next one.